How do humans compare to other intelligent creatures? We humans have the ability to learn, to reason and solve problems. We're self-aware, and we're also conscious of the presence, thoughts and feelings of others. We make tools and practice the art of deception. We're creative. We think abstractly. We have language and use it to express complex ideas. All of these are arguably signs of intelligence. Scientists may not agree on the best and fullest definition of intelligence — but they generally agree that humans are highly intelligent. Other members of the animal kingdom exhibit signs of intelligence as well, and some scientists might say the definition of animal vs. human intelligence is merely a matter of degree - a point that was brought home in 2005 when the London Zoo put "Homo sapiens" on display in the exhibit pictured here. Click ahead to learn about nine other species that stand out for their smarts. If we humans possess intelligence, chimpanzees must have some as well: Our genomes are at least 98 percent identical. Chimps make and use tools, hunt in organized groups and engage in acts of violence. Wild troops have distinct behaviors and customs. Field observations and lab experiments show chimps are capable of empathy, altruism and self-awareness. 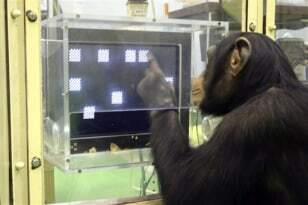 In the experiment pictured here, chimps performed better than humans on a number memory test. 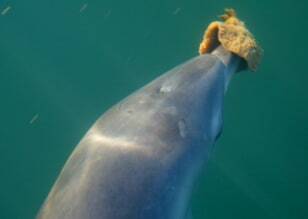 This dolphin in Australia uses a sponge to protect her snout when foraging on the seafloor, a tool use behavior that is passed on from mother to daughter. Scientists say that's just one sign of dolphin smarts. Other signs include distinct whistles and clicks that may serve as dolphin names, perhaps used in a type of language. A famous 1960s experiment found that a pair of dolphins entered a tizzy of creativity once they figured out their novel behaviors were rewarded with fish. Frustrated human test subjects just let out a sigh of relief when they caught on to the idea. The sheer size of their brains suggests that elephants must know a thing or two about the ways of the world. They have been seen consoling family members, helping other species in times of need, playing in water and communicating with one another via vibrations sensed in their feet. 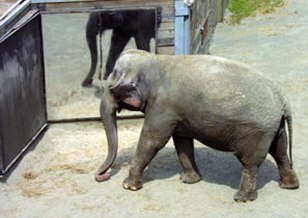 A crowning achievement, some researchers say, was when this female Asian elephant named Happy recognized herself in the mirror. The complex behavior is shared only with humans, great apes and dolphins. Are octopi, squids and cuttlefish smart? That's a matter of scientific intrigue, but such cephalopods are certainly among the brainiest invertebrates in the sea. The cephalopod brain surrounds the esophagus, but shares with the human brain features of complexity such as folded lobes and distinct regions for processing visual and tactile information. The how-smart debate swirls around deciphering observations that the creatures have a seemingly irrepressible curiosity, a disdain for boredom, an ability to learn and the capacity to use tools. 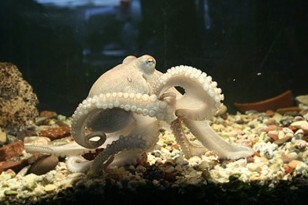 The octopus pictured here exerts precise muscle control to eat. Crows are crafty critters: They fashion tools from twigs, feathers and other bits of debris to snare food from hard-to-reach places. 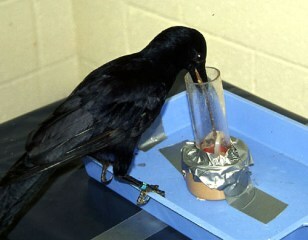 A crow named Betty, pictured here, uses a straight wire she bent into a hook to retrieve food from a tube. The birds are born with a tool-making ethic, but they hone their craft by watching their elders, a sign of higher intelligence. Ravens, a type of crow, have even been shown to manipulate the outcomes of their social interactions for added protection and more food. Is the squirrel pictured here plotting deception? Perhaps. Researchers recently reported that the rodents put on elaborate shows of deceptive caching to thwart would-be thieves. The behavior increased in a lab experiment after squirrels observed humans stealing their peanuts. The researchers called the finding a sign that squirrels can interpret intentions of others, though it could just be a case of learned behavior. Other studies have shown the critters make three-dimensional maps to recall where they cache their nuts. 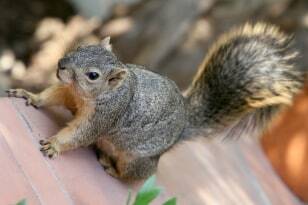 And squirrels in California will cover their fur in the scent of rattlesnakes to mask their own scent from predators. 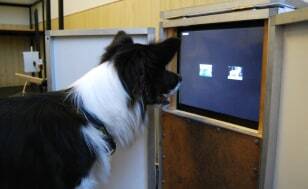 Are dogs intelligent or just really good at basic obedience? They can learn to sit, lie down and fetch, for example, but can they read their owner's intentions? Research suggests they can at least find food in response to non-verbal cues, a type of understanding that scientists think may be akin to the human ability to understand someone else's point of view. The dog in the experiment pictured here accurately discriminated between photos of dogs and photos of landscapes — an indication the dog was able to form the concept of "dog." 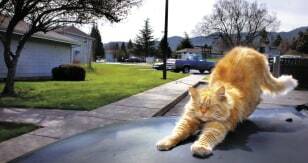 Like dog owners, some cat owners have trained their pets to sit down, roll over and jump through hoops. Cats learn the tricks by observation and imitation, egged on with positive reinforcement. But training cats is harder than dogs. Does that mean they are less intelligent? Not necessarily. Cat experts say felines are just different. They are solitary animals, motivated by the need to survive. This has allowed them to adapt to a variety of domestic environments for at least 9,500 years - even the hoods of cars. Here's the dirt on pigs: They are perhaps the smartest, cleanest domestic animals known - more so than cats and dogs, according to some experts. But pigs don't have sweat glands, so they roll around in the mud to stay cool. A sign of their cleverness came from experiments in the 1990s. 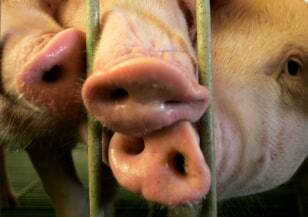 Pigs were trained to move a cursor on a video screen with their snouts and used the cursor to distinguish between scribbles they knew and those they were seeing for the first time. They learned the task as quickly as chimpanzees.